James Dennis Balog is an American photographer whose work revolves around the relationship between humans and nature. Balog was born in Danville, Pennsylvania. Balog’s work has primarily evolved as a combination of art, science and environmental documentary. He made frequent trips to the White Mountains of New Hampshire and the wilderness rivers of Maine, and would later graduate to larger climbing expeditions in the Alps and Himalayas, along with first ascents in Alaska. An avid mountaineer with a graduate degree in geography and geomorphology, James is equally at home on a Himalayan peak or a whitewater river, the African savannah or polar icecaps. Outside of photography, he draws inspiration from the entire range of arts, including music, literature, painting, filmmaking, sculpture and architecture. 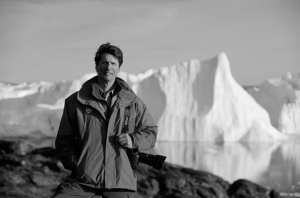 To reveal the impact of climate change, James founded the Extreme Ice Survey (EIS), the most wide-ranging, ground-based, photographic study of glaciers ever conducted. The project is featured in the highly acclaimed documentary, “Chasing Ice,” which won the award for Excellence in Cinematography at the 2012 Sundance Film Festival, as well as dozens of awards at film festivals worldwide. Chasing Ice was shortlisted for the 2013 Academy Awards. It has been screened at The White House, the U.S. Congress, the U.K. House of Commons and the United Nations. James has been honored with many awards, including, in recent years, the Heinz Award, the Missouri School of Journalism’s Honor Medal for Distinguished Service, the Aspen Institute’s Visual Arts & Design Award, and the North American Nature Photography Association’s “Outstanding Photographer of the Year” award. He recently received an Honorary Doctor of Science Degree from the University of Alberta and the American Geophysical Union Presidential Citation for Science and Society. Mr. Balog is the author of eight books. ICE: Portraits of Vanishing Glaciers was published by Rizzoli in 2012. Among his other titles are Tree: A New Vision of the American Forest (2004) and Survivors: A New Vision of Endangered Wildlife (1990), hailed as a major conceptual breakthrough in environmental photography. James lives in the Rocky Mountains, near Boulder, Colorado, with his wife and two daughters.